The U.S. steel industry has been struggling for a long time, but Steel Dynamics stock is way up. If you go back to the end of the last recession, Steel Dynamics, Inc.'s (NASDAQ:STLD) stock price has roughly doubled. The next best performance from a major U.S. steel mill is essentially a price gain of... nothing. Nil. Zero. What is Steel Dynamics doing that the rest of the industry isn't? 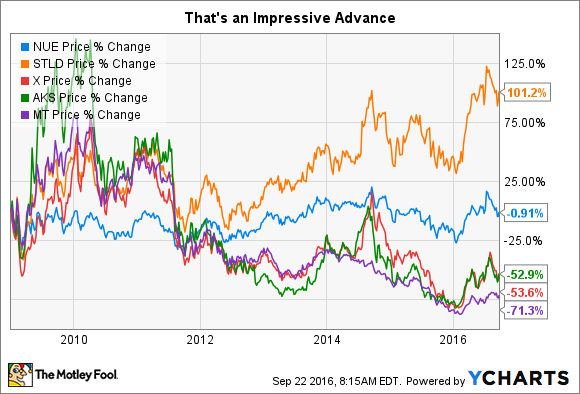 Here's why investors are paying a premium for Steel Dynamics, Inc. The steel industry has been in a funk since the 2007 to 2009 recession ended. Relatively weak demand, oversupply, and heavy competition from cheap imports have all taken a big toll. For example, AK Steel (NYSE:AKS) has lost money every year since 2009. United States Steel (NYSE:X) has bled red ink in six of those seven years. And global giant ArcelorMittal (NYSE:MT), which is a big player in the domestic market, has lost money for each of the last four years. By comparison, Steel Dynamics posted a loss in only two years, 2009 and last year. The only company with a more impressive earnings record is Nucor (NYSE:NUE), which only lost money in 2009. There's no doubt that Nucor and Steel Dynamics have managed to do better than the pack. But why have Steel Dynamics' shares roughly doubled since 2009 while Nucor shares have only managed to break even over that span? The other major mills are all down 50% or more -- in case you were wondering. The reason why Nucor has held up so much better than peers pretty much boils down to its impressive financial performance, conservative finances, and the fact that it uses more flexible electric arc furnaces. (They can be ramped up and down more quickly and use more scrap metal, among other things.) Steel Dynamics has similar qualities, because it's done relatively well financially and also focuses on electric arc furnaces. It's debt at roughly half of its capital structure is higher than Nucor's, at around 35%, but for the most part, the two companies have a number of key similarities. Essentially, Nucor has a legacy. It's a good one, but that doesn't change the fact that it's bigger, older, and more entrenched. Growth is simply harder for this industry giant to achieve. Steel Dynamics is a virtual baby, building itself from the ground up. That means it can use the latest technology and focus on the most desirable industry niches. And it doesn't have the labor issues that come with a long business history: Labor relations have made life even harder for companies like AK Steel and U.S. Steel. In the steel industry, then, Steel Dynamics is something of a clean slate where small moves can have a big impact. And it's used that to its advantage. The most obvious evidence is in its earnings numbers, which have held up better than its peers. But since 2009, the company has been expanding capabilities at existing mills, opening new mills, and making bolt-on acquisitions. Nothing huge, per se, but because of Steel Dynamics' more modest size, these moves have been important growth catalysts. It costs a lot of money to run a steel mill no matter how much that mill actually produces, so the more steel you make, you spread those fixed costs around. This is why utilization rates are so important. Steel Dynamics has a history of running its mills at a higher level than peers. For example, last year, when the industry was running at 70% of capacity, Steel Dynamics hit 79%. So it's growing its business and running its mills more. Those are pretty positive attributes from an investment standpoint. When you look just at the top and bottom lines, Steel Dynamics has held up better than most of its peers. That's one reason why its stock has done so well, while others haven't. But the bigger picture is deeper. Steel Dynamics is a relatively young company, growing its business while others shrink. Moreover, its able to focus on the most modern technology while avoiding legacy issues that make life hard for industry players who have been around for longer. The best part, ironically, may be that it's doing this during an industry downturn, which means things like acquisitions can be done on the cheap. No wonder investors are paying a premium for Steel Dynamics Inc.